Must have for everyone having a D80. 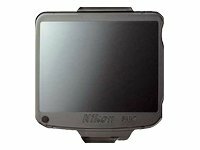 Shipped and sold exclusively by Amazon, this is a must have for Nikon D80 dslr owners. even if you have one, always better to have a spare. I broke my old cover sometime back & put a cheap aftermarket on it, but wasnt completely satisfied. So went ahead and got this, as now its back in full stock! Truly, original parts make a BIG difference to the usability of the camera. It protects the lcd from unwanted dust and smudges and fingerprints. Amazon shipped it free & worth the price completely. a good idea. get two.